Laparoscopic Roux-en-Y Gastric Bypass Surgery is the most frequently performed weight loss surgery in the United States. This surgery got its name from the surgeon Cesar Roux, who first described it. Weight loss surgeries include different surgical procedures performed on people who are obese. The ultimate goal of the surgery is to reduce the size of the stomach by resecting and re-routing the small intestines to a small stomach pouch. Laparoscopic Roux-en-Y Gastric Bypass surgery is typically recommended for extremely obese people with a body mass index of at least 40. Sometimes, patients with lower body mass index are also advised to undergo Laparoscopic Roux-en-Y Gastric Bypass surgery, especially if they have some other serious coexisting medical conditions, resulting from their excessive weight. Laparoscopic Roux-en-Y Gastric Bypass surgery offers some great benefits without any excessive risk of complications. The best advantage of this treatment is that, on average, a patient can lose about 80 percent of excess body mass one year after the surgery. The surgery offers long-time benefits and most patients gain back only 10 to 13 percent of their lost weight in 10 to 14 years after the surgery. As an additional benefit, most of the patients report that some other health issues they had have also been relieved or resolved after the surgery. In most cases, patients report improvement with back pain, high blood pressure, depression and diabetes. In general, people who are about 75 pounds overweight and have obesity-related health problems are good candidates for this type of surgery. People with morbid obesity, who have about 100 pounds of excessive weight, are also suitable for Laparoscopic Roux-en-Y Gastric Bypass surgery. This surgery is performed by dividing the stomach and a small pouch. A procedure is done under the general anesthetics. A part of the small intestine is divided and sewn to newly-created small stomach pouch. As a result, the body won’t be able to absorb as much calories as it did before. Laparoscopic surgery is minimally invasive and it involves making very small incisions instead of one very large. The abdominal organs are usually moved using the harmless gas, and a small camera (also known as laparoscope) is inserted into the incision. 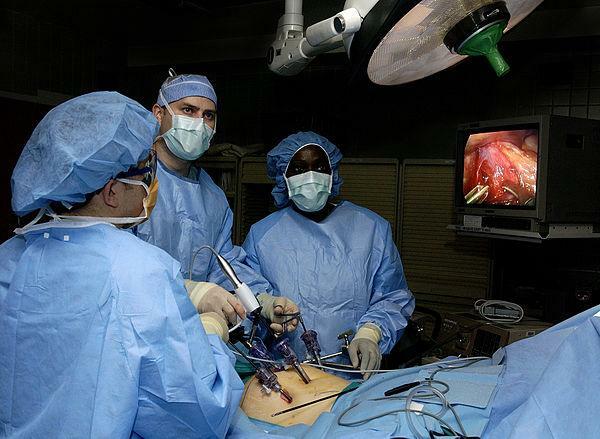 The surgeon monitors the images of the surgery on a video screen and performs the very same techniques that would be used in a traditional open surgery. This technique minimizes the risk of wound infections; it is associated with less pain and quicker recovery. What do you think about weight loss surgery?